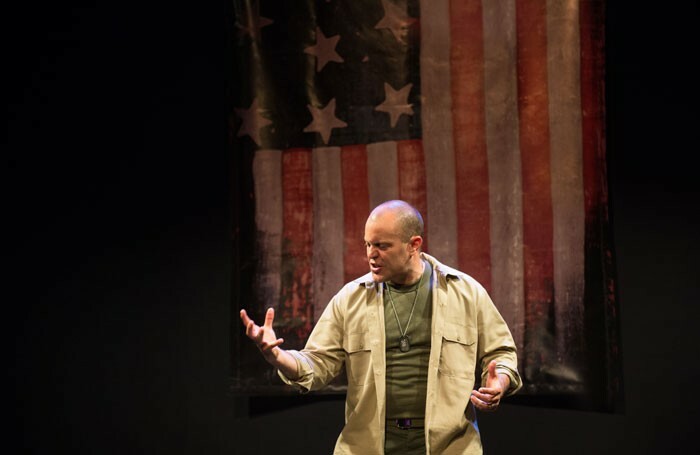 Writer-performer Douglas Taurel presents with sincere and irony-free admiration and patriotism a salute to American soldiers, and the people who loved them, through the ages. In a string of short scenes and monologues presented in thematic rather than historical order, we encounter a Revolutionary War volunteer freezing at Valley Forge, a Civil War soldier writing a pre-battle farewell to his wife, and GIs from every other war zone through to Iraq and Afghanistan. For each serving soldier there is also a veteran having trouble adjusting to civilian life, a wife fearful for her husband’s mental and emotional health, or a parent facing the fact of outliving a child. For each stoned Vietnam grunt or alcoholic vet there is a career soldier or a one-armed veteran just getting on with life. The individual episodes may have very little that is new or especially dramatic to tell us, though the Civil War letter is remarkably eloquent and the father looking for his son’s name on the Vietnam Memorial quietly moving. The power of the show comes from the cumulative effect of one story after another and the convincing sincerity with which Taurel presents them.